The question I have received often since starting my paleo journey is "what do you eat for (breakfast, lunch, snack, dinner?" Breakfast is the hardest for most. It seems simple to throw toast in the toaster, cereal in bowl, or grab some fruit without a thought to protein and healthy fat to fuel your body. Maybe you are rushing after your morning workout, to get kids fed, off to school, and yourself in the car for work. This is a breakfast that I promise, with a little bit of preparation, can be just as simple and enjoyed by the whole family. And the protein and healthy fat will leave you sustained until lunch. I often enjoy this for lunch as well. At the beginning of the week, prep your hard-boiled eggs and bake your bacon (this is less mess option, I will never go back to pan-frying bacon). You can chop your tomatoes and place in container as well (though I prefer fresh tomatoes, if fluctuating price of tomatoes are a concern, there are some relatively inexpensive canned organic diced tomatoes available, I've purchased for about $1). In the morning, mash the avocado, add the egg, tomato, lemon or lime juice, salt and pepper. 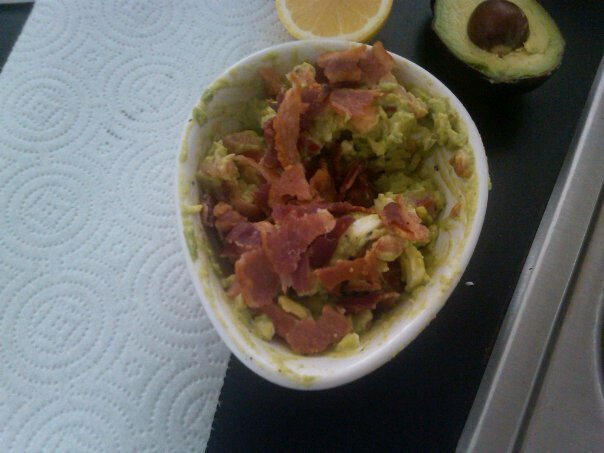 Mix all ingredients together (lightly), top with bacon and enjoy! Some alternatives (if you don't eat pork, for example)- uncured beef or turkey bacon, chicken sausage (Trader Joe's has great minimally processed, gluten free options), canned crab meat, shrimp. Get creative.